In my research I’m looking for ways in which geographical information science and technologies can help citizens to more effectively participate in urban planning processes. The holy grail of participative urban design is allowing citizens to co-design urban interventions in 3D game-like environments. Designing cities in 3D is becoming fairly trivial; an ever-increasing number of advanced city building tools are emerging that employ the latest in 3D technologies. In esri’s CityEngine, for instance, you create cities like you do in SimCity: draw a bunch of roads and the buildings automatically pop-up around them. While extremely powerful, CityEngine and its brethren are ill-suited for citizen-dominated design sessions. These require simple and immersive tools with limited design options that allow citizens to quickly and intuitively sketch their ideas without technology getting in the way of the discussion and deliberation process. Even though one can fathom remedies for these barriers by e.g. employing a modeling expert to translate citizens’ ideas into a CityEngine design, we seek instruments that enable citizens to craft a plan of their own with as little assistance as possible. These tools should furthermore be deployable in real-world circumstances: few municipalities and governmental institutions have the human and financial resources to create proper canvases in CityEngine, let alone use these during deliberation sessions. 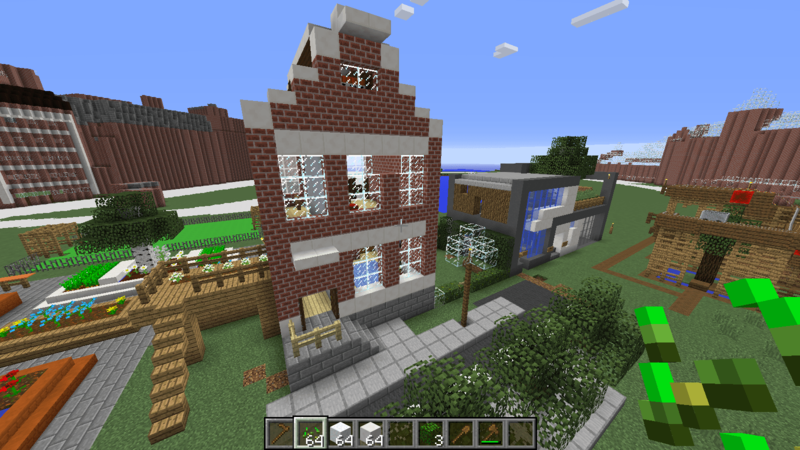 We were thus thrilled when we stumbled on the Block by Block project: participatory urban planning using… Minecraft! Minecraft is an extremely popular video game in which the world is made out of blocks. Players can manipulate any block in the game: remove it, add a new one on top and another one. Before you know it, you’ve built a house or a castle. It’s digital Lego in an endless world. 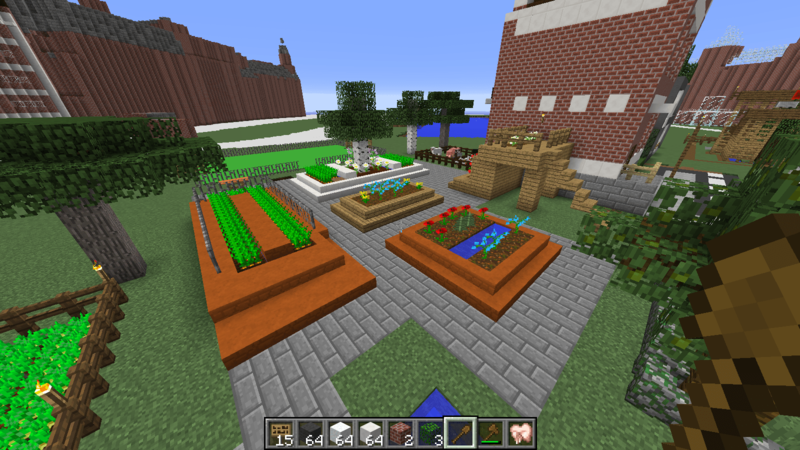 In Block by Block, the United Nations Human Settlements Programme (UN-Habitat) and Mojang, the creators of Minecraft, use Minecraft to involve citizens in urban planning processes. 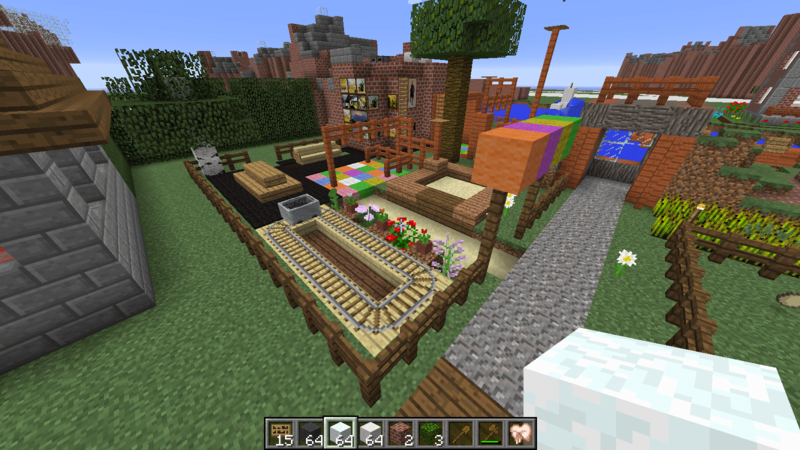 At the start of each Block by Block project, a group of expert builders rebuild the area under scrutiny in Minecraft. The first couple of projects haven been created by FyreUK, a YouTube community that specializes “in all Minecraft content”. Their time-lapses of the rebuild process are fascinating. The virtual worlds look surprisingly realistic. Once the real-world area has been rebuilt, citizens are invited to extend it with their ideas and wishes by building on top of the virtual canvas. Minecraft turns out to be perfect for citizen-dominated design processes as it is easy to operate, pleasant to look at and fun to play. Its blocky appearance is an important forte. The real-world is simplified in a pleasant yet believable manner. The cute graphics and lifelike objects and materials (grass, trees, flowers, animals, stones, bricks, etc.) trigger a form of suspension of disbelief. People quickly accept the simplified artificial world and engage with it. Decreasing the “resolution” of the world and the objects in it aids the expressiveness of the “instrument” as it only takes a couple of well-placed blocks to suggest a recognizable structure. Its multiplayer functionality allows people to collaboratively and asynchronously build whole cities. This is an interesting addition to current synchronous modes of participation that involve meetings at real-world locations at fixed times. Inspired by Block to Block we set out to pitch Minecraft at a workshop in Pakhuis de Zwijger (PDZ) in Amsterdam. PDZ is a non-profit cultural organization that experiments with and hosts events on innovative urban planning practices. We joined a session on participatory design of a park in Zeeburgereiland, a to-be-built neighborhood in Amsterdam. A group of future residents have come together to turn a vacant lot into a neighborhood park. 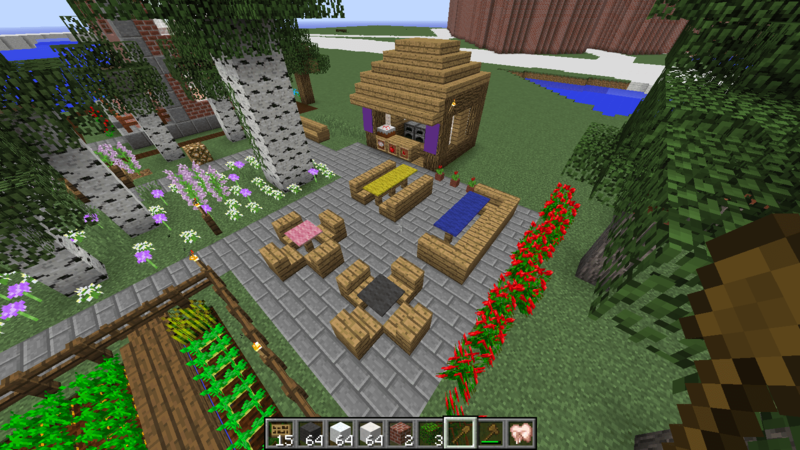 This was our first attempt to bring Minecraft to a collaborative design process. We were mainly interested in whether the idea would fly: how would people react to a game, will they find the world likeable and convincing, would they be able to operate Minecraft comfortably and would we be able to turn discussion topics into Minecraft structures in real-time. In addition, I was interested to see what role the multiplayer functionality would play during and after the session. Whereas the Block by block worlds are built by hand, we set out to automate the process as much as possible. To this end we created a CityEngine script that takes the 2D building footprints from the Dutch Building and Addresses registry and raises them to their real-world heights as recorded in the Dutch elevation model. The result is a pretty decent-looking city. 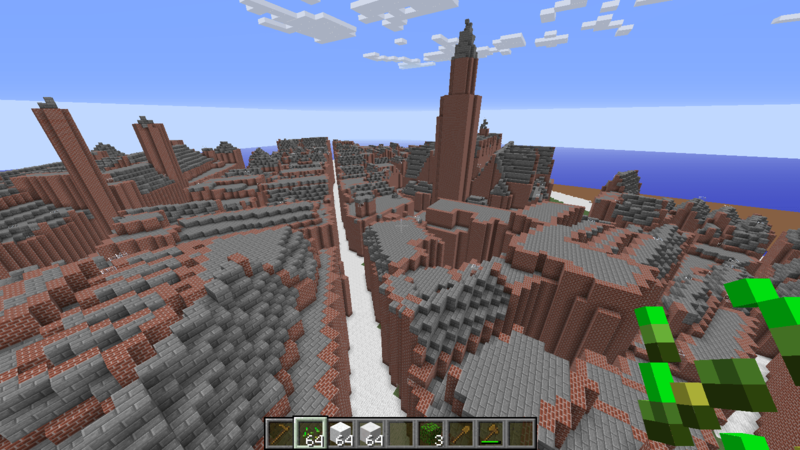 Although the cityscape looks interesting and recognizable, it feels desolate and barren, especially if you are used to Minecraft’s lively scenery. 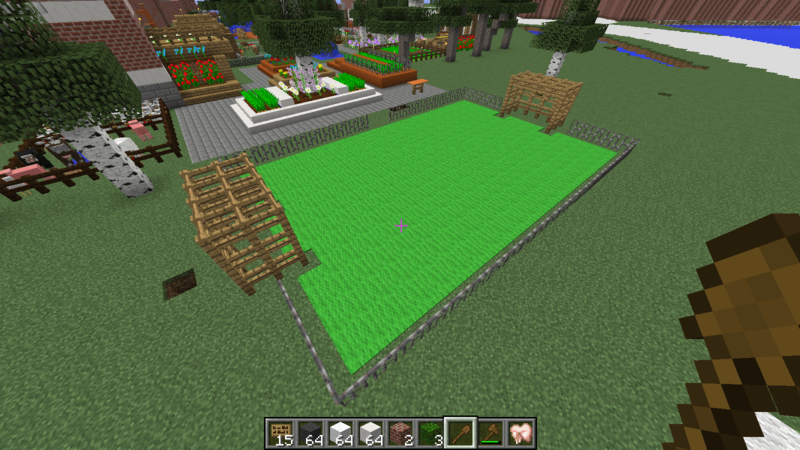 We are currently researching what makes a scene look pleasant and how to automatically create the needed Minecraft artifacts such as trees and streets from authoritative geographical data, and how to convincingly populate the scenery with grass and flowers. To beautify our virtual Amsterdam a little and to show off Minecraft’s capabilities, I configured and installed a server and invited a colleague and my brother to join and build some park-themed structures. 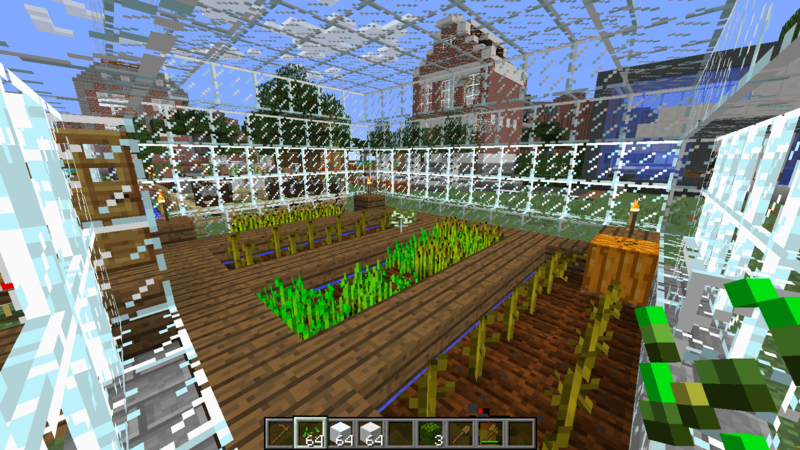 In a matter of minutes my colleague built a greenhouse complete with different types of crops. He also put a small house with a simple and pretty interior opposite the greenhouse. 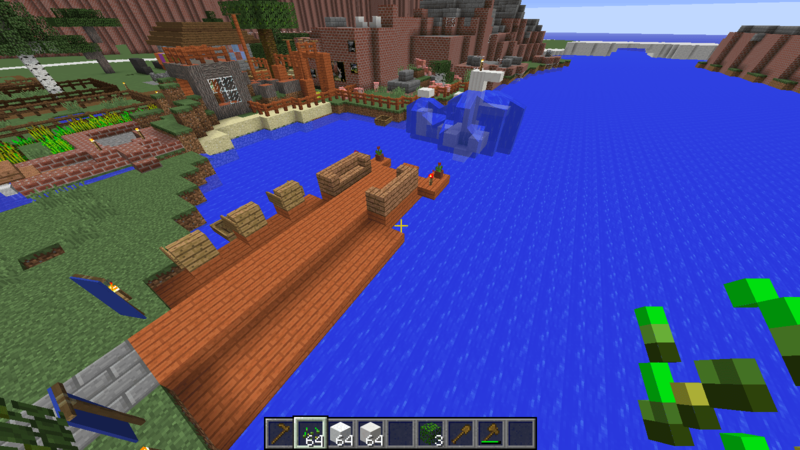 I started by building a pier with a fountain in the adjacent lake. Meanwhile, my brother took the Amsterdam theme to heart and constructed a typical Dutch/Amsterdam house. I concluded our preparations by building a playground. The workshop was attended by approx. 20-30 people. Half of them were current and future residents, the other half were professional ‘placemakers’, students and a representative of the municipality. The goal of the evening was to create preliminary designs for the park. I brought two colleagues along mainly to demonstrate the co-design capabilities offered by Minecraft’s multiplayer functionality. The evening was kicked-off by two trailblazers from similar initiatives who talked about the early stages of their projects, how they keep them going and what they plan to do in the future. One of the speakers was spot on topic as she shed much-needed light on how to motivate fellow citizens to participate in these types of initiatives. An attendee asked in which phase of the design process Minecraft fits best. My feeling is that Minecraft will be most useful right after an initial sketching session on paper: citizens/kids can take the sketches and rebuild them in Minecraft in 3D. Once there, I expect discussions to be more concrete and fruitful as it is easier to get a sense of distance, scale, heights, proportions, visibility, etc. After our presentation the discussion gravitated towards what is/isn’t allowed on the designated spot and how to kickstart the project. In the meantime my colleagues listened and cheerfully built stuff based on the discussed issues. For instance, citizens are, for some obscure reason, not allowed to put anything in the ground. Planting flowers is forbidden. The solution: containers filled with soil. We built that in under a minute in our virtual world. We also constructed a nice cafe. Unfortunately we did not get to co-design with the citizens and Minecraft as we ran out of time. In addition, the project is in an early stage. The citizens are searching for inspiration and advice on how to organize themselves and motivate their neighbors to participate. 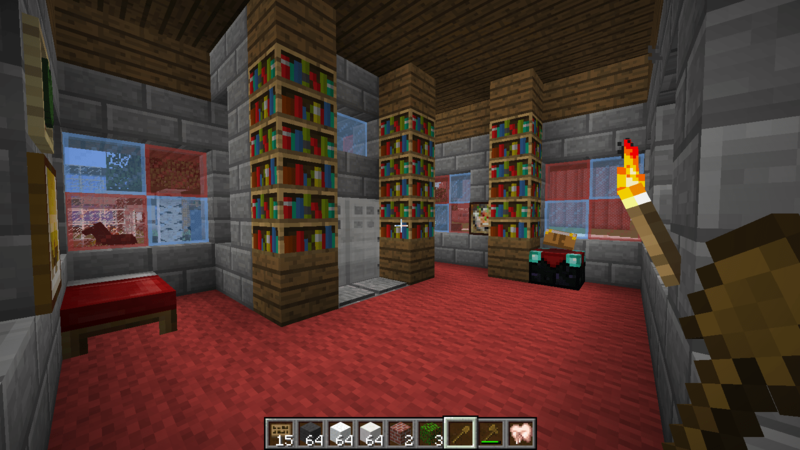 Many questions remain therefore open: is Minecraft really as easy to use as it looks? Is it a viable replacement for other 3D instruments? Is the multiplayer functionality useful or is the asynchronous design idea a myth? Are ‘adults’ and professionals inclined to work with Minecraft? Afterwards I got in touch with the principal of the local school and the trailblazer of another initiative. They were interested in the idea and we agreed to seek for opportunities to collaborate… to be continued!